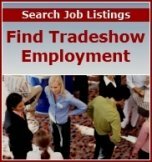 Find tradeshow jobs that match your experience and desired market by entering your employment search terms in the boxes provided below. Job postings are provided by ZipRecruiter.com. Please note these listing are provided by ZipRecruiter.com, which is an independent entity from Trade-Show-Advisor.com. The publisher of Trade-Show-Advisor.com is not liable for job listings, information or anything else provided by ZipRecruiter.com. Disclosure: Trade-Show-Advisor.com is paid a commission for inquiries made through the above links that help fund publishing this website. There are a wide variety of career options in the trade show industry that require different skills and expertise for success. Jobs range from entry-level coordinator and event logistics positions to display design, construction, and management-level responsibilities. Examples of trade show jobs include positions such as conference planner, project manager, lighting engineer, event specialist, trade show demonstrator, exhibit designer, logistics manager, freight estimator, trade show marketing director, sales representative, and more. Working in the industry takes commitment and hard work. You must have the flexibility to travel in most cases and can expect to work long hours, including evenings and weekends. This is a deadline-oriented business that requires diplomacy, along with a high level of organization and flexibility. Yet trade show jobs can also be exhilarating, challenging, and rewarding for the right person. If you have never worked in the industry, seek out those who do and talk with them. Learn about the skills required for specific positions that interest you. Then, seek out opportunities to gain hands-on experience (even through volunteering) and related training that will enable you to be a prime candidate for open positions that appeal to your interests.